Cornelis Jacobus Gorter was born in Utrecht on 14 August 1907. He went to school in The Hague and studied physics in Leiden. In 1932 he obtained his doctor's degree with W.J. de Haas, on the thesis Paramagnetische Eigenschaften von Salzen. After a position at the Teyler's Foundation in Haarlem (1931-1936), and at Groningen University (1936-1940), Gorter succeeded P. Zeeman as full professor at the University of Amsterdam. In 1946 he returned to Leiden as successor to W.H. Keesom and after 1948 also to De Haas, remaining the director of the Kamerlingh Onnes Laboratory until his retirement in 1973. Over this period he had more than 70 Ph.D. students (search for "Gorter" in this listing). Cor Gorter died in Leiden on 30 March 1980. 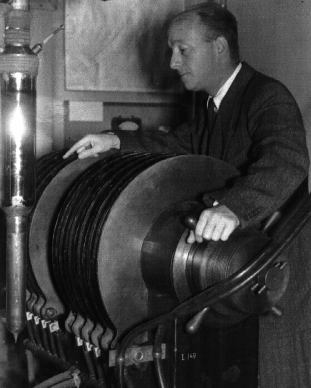 Gorter was the first to demonstrate the phenomenon of paramagnetic relaxation (1936), and narrowly missed the discovery of nuclear spin resonance. The history of these intriguing years has been described by J.H. van der Waals, in an article entitled Gorter's footprints on the trail that led to magnetic resonance. Gorter himself wrote a small book on "Paramagnetic Relaxation", during the winter of 1944-1945, in hiding from the German occupation. Gorter was an experimentalist who was also skilled at developing theoretical ideas. He used the Meissner effect to predict the reversibility of the superconducting transition and already in 1935 suggested the importance of short-mean-free path effects for explaining the peculiar behaviour of superconducting alloys (now known as type II superconductors). Together with H.B.G. Casimir he formulated a two-fluid model in which many properties of superconductors could be interpreted by applying thermodynamics and Maxwell theory. (Here is a reminiscence of Gorter by Casimir.) The "Gorter model" of a second-order phase transition, arrived at by purely thermodynamic reasoning, dates from the same period, as does his explanation of the "Senftleben effect" (the change in viscosity and heat conductivity of a paramagnetic gas in an external magnetic field). In the sixties, J.J.M. Beenakker would develop this effect into a powerful experimental probe of the interactions in gases of nonspherical molecules. Returning to Leiden after the war, Gorter devoted much of his energy to the transformation of the Kamerlingh Onnes Laboratory into a cryogenic lab with modern electronic and instrumental equipment. With his students D. de Klerk, M.J. Steenland, O.J. Poppema, W.J. Huiskamp, H. Postma, and A.R. Miedema he began to investigate magnetism and related subjects below 1 Kelvin by means of adiabatic demagnetization. In 1948 Gorter (and independently M.E. Rose) suggested a technique to polarize nuclear magnetic spins by making use of the coupling to the electron spin (which resulted in very strong internal atomic magnetic fields). This technique was used to determine the anisotropy of gamma rays emitted by oriented radioactive nuclei of cobalt. Inspired by Gorter, N.J. Poulis and J. Ubbink investigated antiferromagnetism of copper chloride using nuclear magnetic resonance spectroscopy. 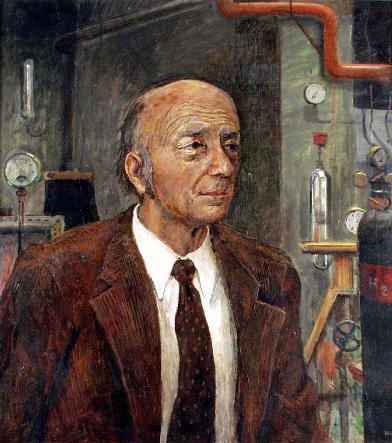 H.C. Kramers and Gorter's research on liquid helium II led to the experimental confirmation of the phonon and roton contributions to the specific heat, predicted by L.D. 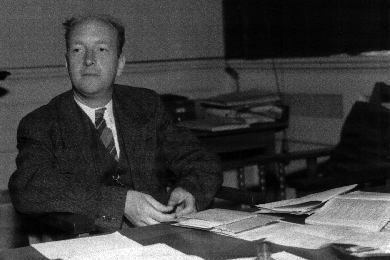 Landau in 1947. Moreover, Gorter and J.H. Mellink established the empirical relation for the mutual friction between the normal and superfluid components in liquid helium II, when these are in relative motion. A theoretical contribution of Gorter from that period (1951), which has been fully appreciated only recently, is the explanation of the increase of the low-temperature electrical resistance of granular metallic films. This effect is now called the "Coulomb blockade", and is at the basis of the technique of single-electron tunneling. Gorter was lively, ambitious, brilliant, and energetic. He loved to travel and contributed much to international scientific cooperation by committees and organizations which he chaired. Six volumes of the series "Progress in Low Temperature Physics" appeared under his editorial direction. In 1966 Gorter received the "Fritz London Award" for his wide-ranging contributions to low-temperature physics. In his acceptance speech, entitled Bad luck in attempts to make scientific discoveries, he described how he had just missed making a number of important discoveries. It is typical for the personality of Gorter that he emphasized his "failure" rather than his many achievements. Gorter was a true "general physicist", a man who frowned on specialization and considered the whole of physics as his playground. The Leiden Institute of Physics still benefits today from the love and dedication that he devoted to his laboratory.